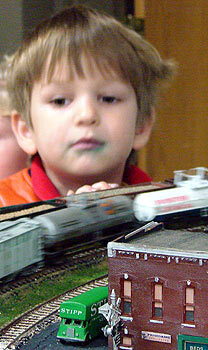 Ace checked out the Joplin (Missouri) Museum Complex Train Show and Swap Meet last Saturday, November 24. The building in which the show was held also houses the Joplin Mineral Museum, which, along with Schifferdecker Park in which it resides, have been "recognized by Hampton Hotels Save-A-Landmark program as a site worth seeing." Proceeds from admission charges to the show ($3 each) went to the Joplin Museum Complex. 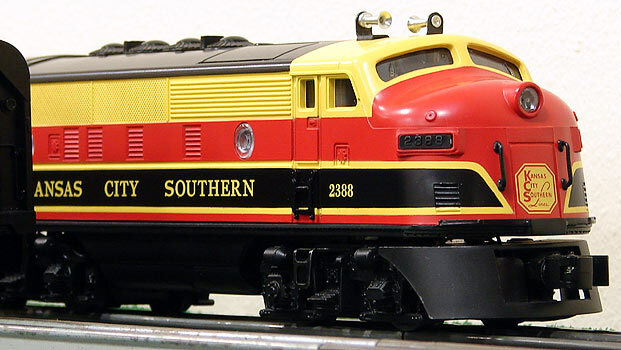 This Lionel O-gauge model of a diesel passenger engine is painted as a late version of the Southern Belle, a Kansas City Southern passenger train. I was pleased to run into Jim Taylor, a childhood friend of mine. Jim and I chased many a train in our younger days, and even modelled a few. I learned photography for just that purpose, and Jim was always nearby with a radio, listening to the St. Louis Cardinals. Life sometimes works in predictable, albeit fortunate, ways. I became a photographer, and Jim is a well-recognized voice in sportscasting in southwest Missouri. I only dabble in trains these days, having lost interest in all but classic locomotives. 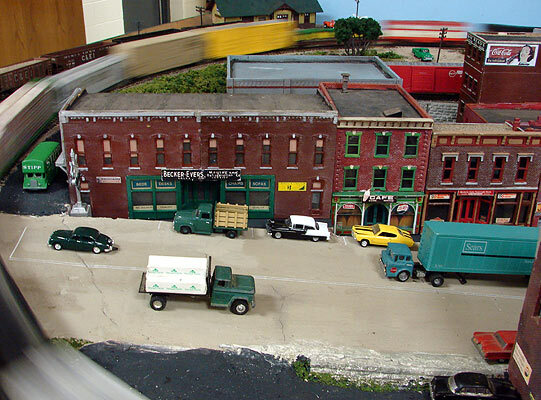 Jim stays updated on the railroads' various doings, and rides the upward curve of model railroad materials and technology. And, man! The hobby is light-years ahead of where it was when my brother and I ran HO trains with friends in my parents' attic. 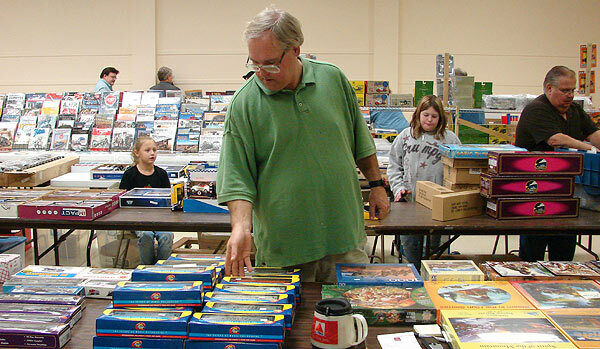 Jim is inspecting some of his work on the Tri-State Model Railroaders Club layout, which was on exhibit at the show. 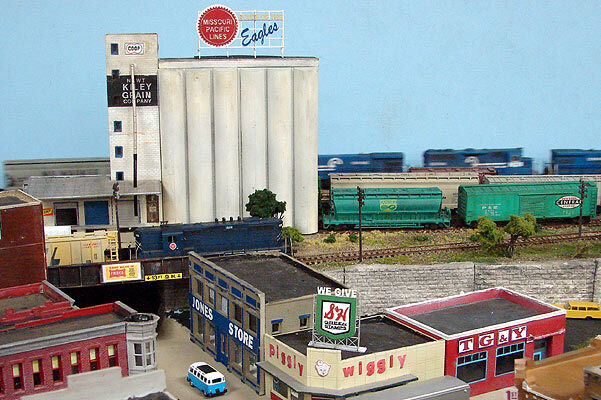 Model layouts often have fictional identities; this end of the club's layout is the town of Lanier, named for Willie Lanier, Football Hall of Fame linebacker for the Kansas City Chiefs. Jim, and fellow enthusiast Dale Rush, made this grain elevator, which is named for Newt Kiley, a character from the Green Acres TV show. 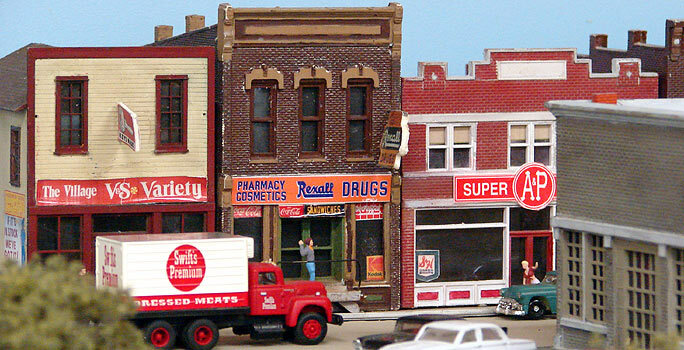 The Piggly Wiggly building is a kit from the company, City Classics. The lettering came from photographs of a store in Warrensburg, Missouri. Jim made these buildings and two other model railroaders - Ned Mayes and Gregg Whitsett - did the roadway. They plan to add sidewalks. Becker-Evers is an actual furniture store in Jefferson City, Mo. The Village is designed from a store in Anderson, Mo. The hanging Rexall sign is made from a photograph of the former College Pharmacy in Carthage, Mo. Every time I see a Rexall sign, I shed an inner tear for Hunter Drug in Greensburg, Kansas. Jim made this bus depot from a Walthers Kit. The town at this end of the layout is named Gibson, for Bob Gibson, Baseball Hall of Fame pitcher for the St. Louis Cardinals. 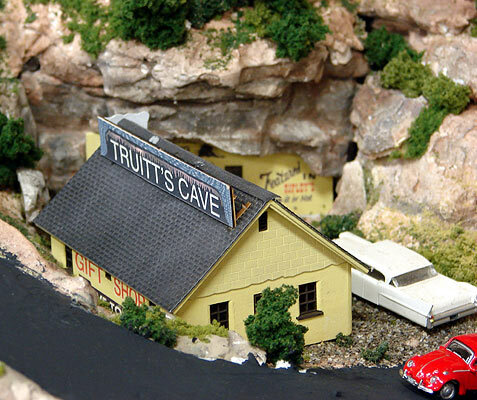 Dale and Ned made this close replica of the Truitt's Cave building - a Lanagan, Missouri, institution - from scratch. 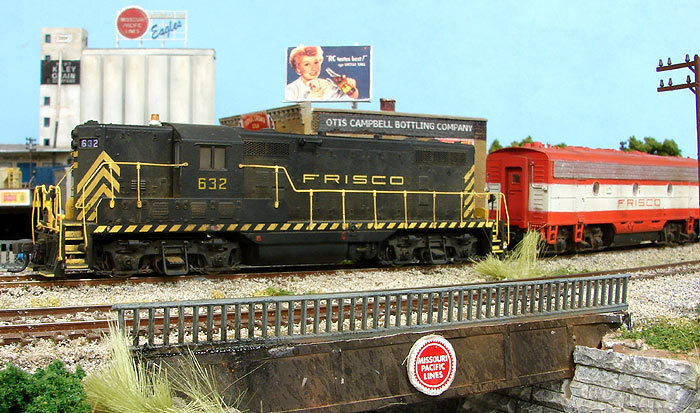 The late Frisco railroad is very dear to me, as it ran across the street from the house in which I grew up. Jim customized this Atlas model company Frisco GP-7 to look like one that regularly ran in Joplin. Ned and Jon Sykes made the trestle. The Otis Campbell Bottling Company is an homage to Otis Campbell, the town drunk on The Andy Griffith Show. I was tickled to see a couple of Route 66 touches at the show. Jim made this barn from a kit. 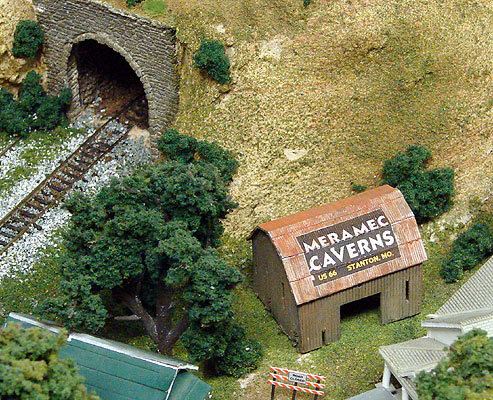 Ned Mayes made the Meramac Caverns decal and Jim applied it. Jon made this bridge This bridge is a kit from Luck of the Irish, a Kansas City company. It reminds me of the rainbow arch bridge along Route 66 in Kansas. 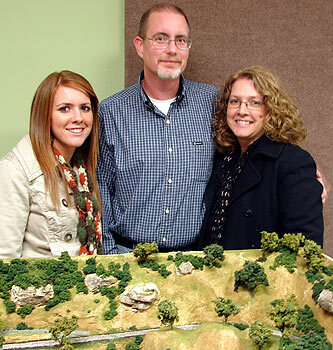 Model railroader and entrepreneur Dale Rush poses with his wife, Karla and daughter, Leanna. This layout is N-gauge - smaller than the previous one pictured. 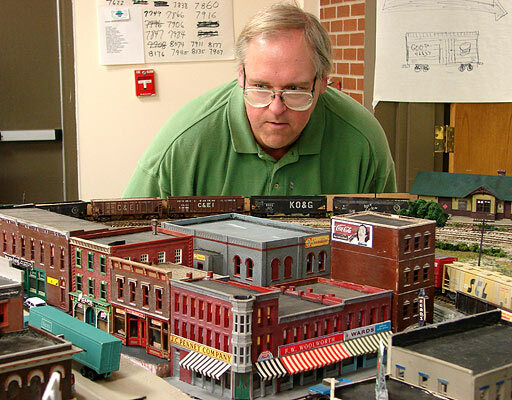 Rush owns Blain Line LLC, a company specializing in the model railroad buildings and signs he displays on his layout. 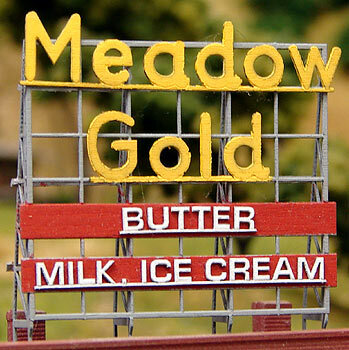 Take a closer look at his Meadow Gold sign; it's probably modeled on the one that used to grace the corner of 11th and Lewis in Tulsa, along Route 66. And lo and behold - another Meramac Caverns barn. 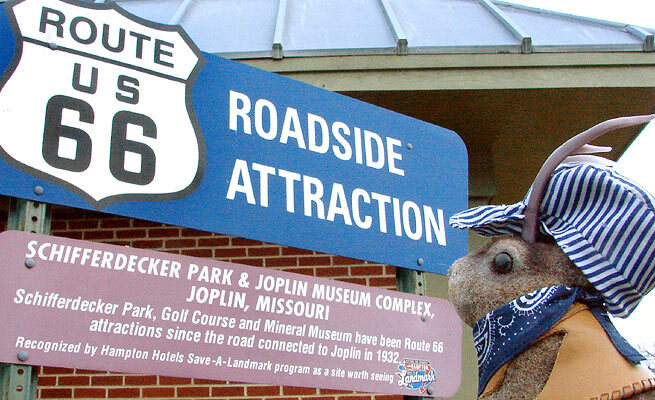 Rush is quite the roadside attractions aficionado and says he actually prefers roadside attractions to railroads. 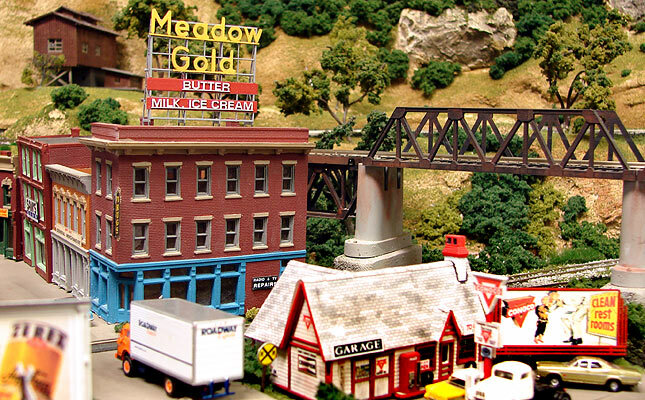 However, model railroaders are pretty much the customer base for model buildings and signs. I'd say the layouts met the expectations of this young fan. i am from Indonesia, i make toys from recycling.my toys show in local tv, i like to your toy, ihope we can do some thing together.